O M G. Those are the only words (letters?) I have for these. Valentine’s Day is upon us — the perfect excuse to spoon feed these to your husband while wearing lacy lingerie. Or…spoon feed them to yourself while wearing flannel pajama pants, your Napoleon Dynamite XXL tee, and drinking coffee. That’s what I did. You must, must, must follow the directions and chill these overnight. They have a lot of espresso powder in them and if you eat them immediately you'll die of an espresso overdose. After chilling it all mellows out and the espresso is a faint hint in the background. This recipe requires overnight refrigeration! Preheat the oven to 350 degrees F. Line a 8 by 8-inch metal (not glass) pan with foil, leaving enough foil to hang over the edges of the pan. Butter and flour the foil; set aside. In a double boiler (or a large glass bowl set over a pot of simmering water), melt the butter, 8 ounces of the semi sweet chocolate chips and all of the bitter sweet chocolate. Stir to combine, then allow to cool slightly. In a large bowl, whisk together the eggs, espresso, vanilla and sugar. Starting in small amounts, add the warm chocolate mixture to the egg mixture; allow to cool to room temperature. In another bowl, sift together 1/2 cup of the flour, the baking powder and salt; stir into the cooled chocolate-egg mixture until just combined. In another medium bowl, toss the pecans and the remaining 6 ounces of chocolate chips with the remaining 2 tablespoons flour; add to the chocolate-egg- flour mixture. Pour half of the batter into the prepared pan and smooth the top. Arrange the candy in a single layer over the batter, making sure the Snickers reaches the edges of the pan. Top with the remaining batter and smooth. 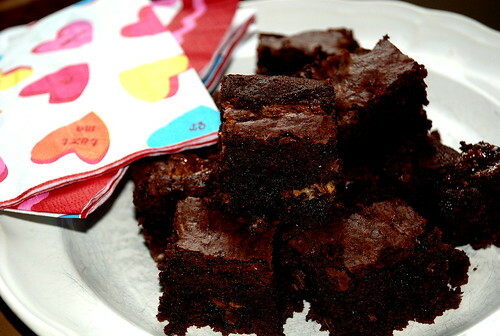 Bake for 27 minutes; although the brownies will not be firm, do not over bake. Allow to cool, then refrigerate overnight. Remove the brownies from the pan using the foil overhang and cut into small squares with a serrated bread knife (if you have one, it will make cutting these easier). Store in the refrigerator. **Still kidding. Don’t flame me.